I would also appreciate any tips on how to reduce the redness. I'm using cetaphil in the morning and in the evening, in the evening I also use duac (whole face). In the morning I use a tonic with tea tree oil (i assume the content of tea tree oil is very mild though) and then an oil-free moisturizer called Topexan which is also antibacterial. I exfoliate twice a week using a gentle Nivea exfoliating mask. Please tell me that there is still hope. Right now the redness is the worst part because if not for the redness, I think that my skin would look kind of healthy since minus the few small bumps it's actually nice. I don't have acne anywhere else. Hang in there...do u drink lots of water, take vitamins and juice? When I was a teen I had acne on my cheeks just like you. Unfortunately, I picked at them too much and ended up with pitting. They did eventually go away with time and some work and now I get compiments on my skin (I still find it hard to believe people when they tell me that), but I didn't start off with the beautiful skin that you have, so yes there is hope! I lean towards natural methods to relieve acne. 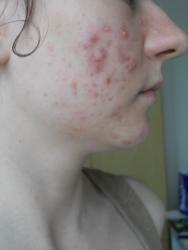 I am dealing with a teen-age son who has acne which has a lot of redness. He is resistant to my suggestions a lot of the time which is extremely frustrating, but there are a two things that work to reduce the breakouts and redness when he cooperates - baking soda and green tea. The baking soda is made into a paste and applied to the breakouts and rinsed off after 5 minutes. The green tea is made very strong and sea salt added to it and it can be applied and left on. Search "green tea sea salt toner" on this site to read the specifics of the recipe. Please keep us posted and congratulations on the success you've achieved! Thank you so much for the encouragement! I will try your method (maybe starting off with green tea only first) and keep you posted with the results! It's really good to hear a success story, especially at this stage! My redness usually fade fast.. it used to be like yours. What I do is apply aloe vera(fresh). I also eat healthy and I've been drinking a lot of water lately. I used not to drink a lot. I do think there's hope for you! After I posted to your thread last night I realized a painful pimple was developing above my lip. I don't get them much these days and this one really hurt so I went on the attack. Previously I probably would have piled on BP, but I tried something different this time. I applied my green tea salt toner to it every half hour for about two hours. Then I decided to pile on some baking soda. I think I left it on for 20 minutes or so and I pressed it in a few times. After that I continued dabbing on the green tea /salt toner every half hour until bedtime, probably two hours. And the result this morning is that it has subsided and is only slightly painful and not as red. I will continue the process today since I will be home most of the day and see if I can help it along even further. I just thought I'd pass this along because I was quite pleased! I hope your found the green tea and salt toner thread. Your right the redness seems to be making it look a little worse than it actually is as you don't have that much inflammatory acne which is good. Duac is supposed to be really good and many people rave about it. Like anything it just takes time, The best thing you can do is to try keep your routine minimal maybe take the exfoliation out which could be causing some irritation. I've been on duac before, I think more than once, but it never worked. Last time I was on it for a month and it didn't work at all so I quit. At that time my skin wasn't as bad as it is now but after a while it got really, really bad so I got back on it. Right now it is working marvels and I have no idea how or why but as long as it's working, I'm perfectly fine with that!!! I haven't exfoliated much before, I've started a few weeks ago since my skin was really flaky and I hoped it would help... I wish the redness would just go away because it's so annoying!!! Right now I'm going to try the green tea toner suggested by gingergirl22. I am really hoping it will help. I will post some pics in a while. Thanks everyone, your suggestions really help! I am wondering if you should omit the sea salt from the toner because I think that has a drying effect. You can always add it in later, or split the batch in half and have one with salt and the other without so you can experiment. I just made a fresh batch with sea salt and I am only going to apply this to the pimple from now on and not use the baking soda. So far so good. It is barely visible. Btw, the first day I made this toner I applied it to a blemish that was on my face for two years. I don't know what the heck it was actually, but I tried every imaginable thing to get rid of it but it for two years and it wouldn't budge. It looked like a blackhead but raised and it was just to the right of my eye so it was so noticeable. I was blown away on that first day that I reached up to feel it and it was gone. I am still in disbelief...I keep reaching up for it to see if it is truly gone. That's what sold me on this solution! I drink water, black tea or fruit juice, once in a while I might have coke or some other fizzy drink but that's about it. Your diet is good! I don't see any problem with your diet other than animal foods which should be consumed very very very less., but it seems you don't eat a lot of animal foods which is good. It is bad for our body system, etc. I do believe a raw diet makes our skin better. i tough you said "my diet is perfectly fine"
cut pasta, bread, all dairy, pizza, onioin, garlic, oranges, eggplants. im also not gluten intolarant and gluten breaks me out. also avoid nuts, soy and eggs. what is bad about animal food? Maybe I'll just stop eating all together. whats the point of asking help if your not willing to do anything. I don't think my diet is the problem because it hasn't changed in the last 10 months (as opposed to my skin which went crazy). And sorry but it's quite hard to cut on everything you said I should cut on and still have a balanced diet and get all the things my body needs. As I said, I am allergic to lots of things so I can't just cut things like that. And it's not like i stuff myself with dairy or pasta or anything, I eat in moderation. And from your posts it seems like I don't care or don't do anything, maybe that's cause they are so short and impersonal. And quite rude, especially the penultimate one. So excuse me for getting annoyed with what you say. I learned plants have the good calcium while milk (cows, etC) contain the bad one. So dairy products is not really needed in your diet. look, i eat this diet for almost a year, and people ate this diet for millions of years and guess what, we are still here! if its not diet then what is it? the weather? global warming? pollution? the only other thing that may cause acne is hormones=excessive DHT. so you can take dht blocker and see if that helps. Just keep trying different methods but remember to never touch and give whatever new methods at least a month or so to work! worst mistake people make is they dont give there new regime time to work! most of all just keep smiling and battle it....... eventually you will win! You might want to try leaving out the tea tree tonic for a while. Tea tree oil serves basically the same purpose as the BP in Duac, and both can really irritate your skin. It's possible that the tonic is helping, but it's also possible that it's just making things worse, so (if you haven't already) you should see what your skin is like with just the Duac, cetaphil, and moisturizer. Also, I know you said you don't think your diet is the problem, but try avoiding dairy for a few weeks. If it even helps just a little bit, it's worth trying right?